Beloved sweaters that have become too small or worn are the stars of some great DIY decorating projects. So don't just toss that cardigan into the trash bin, transform it into something useful and wonderful. If your tastes have changed or you’ve outgrown a favorite old sweater, you have options aside from donating the garment or throwing it away. 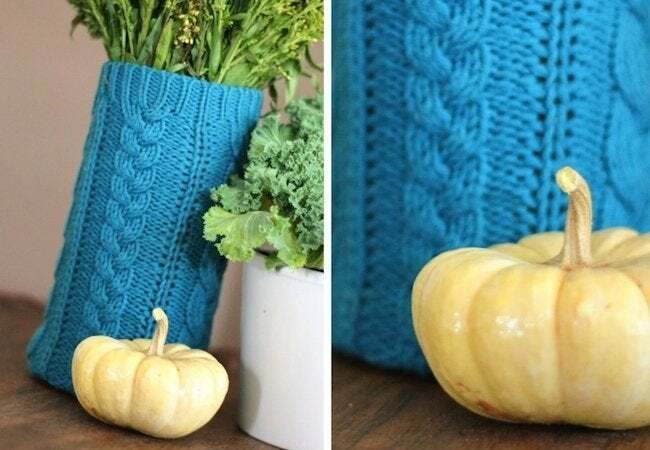 Recycled sweaters are excellent for a range of home decor DIY projects. In fact, the things you can make with recycled sweaters are so cozy and charming, you might start trolling thrift stores especially to buy knitwear not to put on, but to repurpose. Scroll down to see five wonderfully creative uses of recycled sweaters. 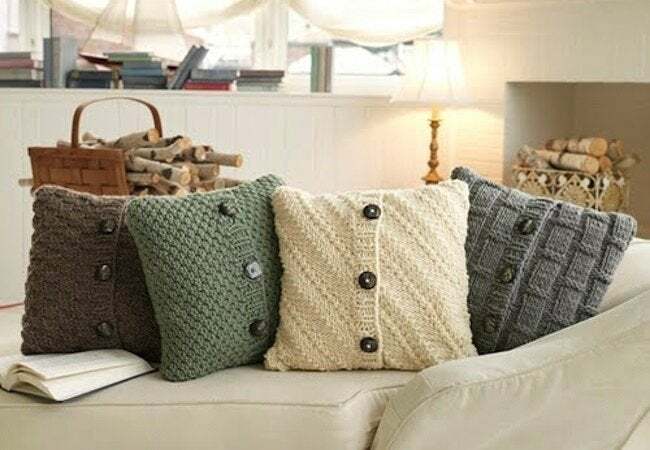 Recycled sweaters are natural throw pillow covers: Simply remove the sleeves from an old cardigan and cut the body into two squares, serging the edges so they don’t fray. Once you’ve sewn those squares together, you’ll have a cushion cover with a button front that makes slotting in a comfortable pillow hassle-free. It’s thoughtful and gracious to bring a little something for your dinner host. If your gift of choice is wine, decorating the bottle makes the gesture more special—and a bottle “bag” of your own creation is a particularly lovely touch. 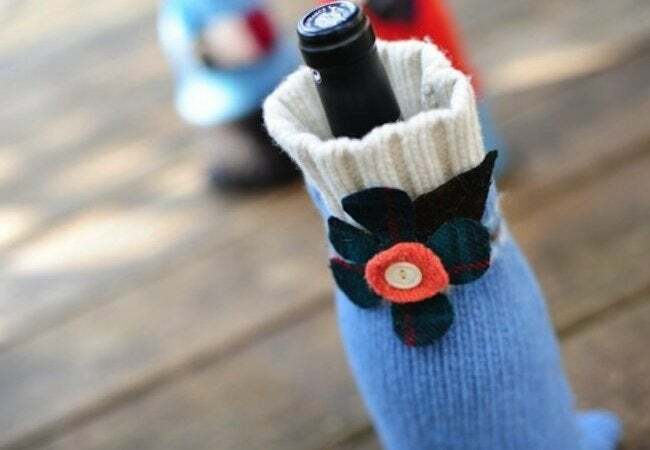 To make one, cut the arm off a sweater, then fit the sleeve over the wine bottle. Sew the bottom of the sleeve closed and, for a final flourish, tie a decorative ribbon around the covered neck of the bottle. Recycled sweaters are great for any pet owners who want to go the extra mile for their cat or dog. 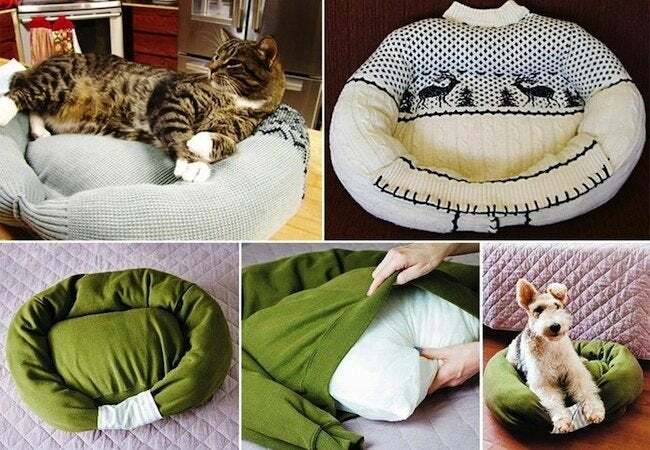 With surprisingly little modification—a bit of sewing here, a bit of padding added there—a sweater can become a bed for Fluffy or Fido. Best of all, you can choose a sweater that coordinates perfectly with your existing room decor. It’s increasingly common to carry reusable grocery bags on errands and shopping trips. We love their benefit to the environment, that’s for sure, but we don’t always care for their looks. 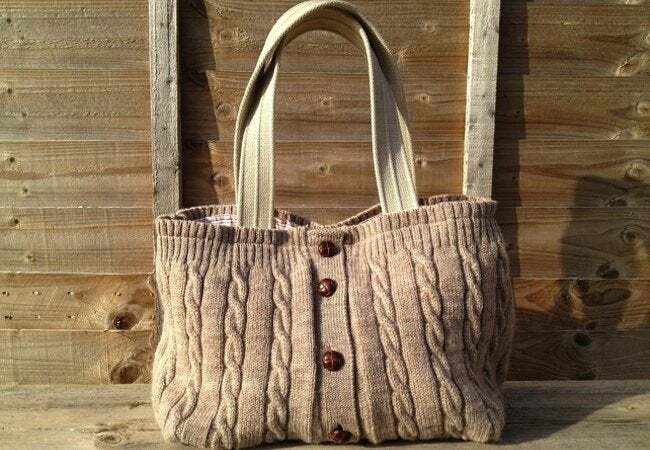 Luckily, you don’t need to be a master of the sewing machine to make an attractive bag from a sweater: With basic hemming, you can transform yesterday’s sweaters into today’s totes. Instantly customize any cylindrical vase or candlestick with the turtleneck or sleeve of a sweater that has a color or pattern you love. So little time and effort is involved, you might even choose to create different sets of these cozies, one for each season, along with special one-off creations for birthdays and holidays.